Twice life-size, this unbreakable vinyl replica first divides into right and left hemispheres, then further splits the right half into three segments. Component parts are locked together with pins and stay together for pass-around until pulled apart. 50 principal features of the cerebral lobes, cerebellum, brain stem and ventricles are number coded and identified in the accompanying 3-page key. Perfect for introductory study. Our biggest brain. A whopping 2.5X life size. 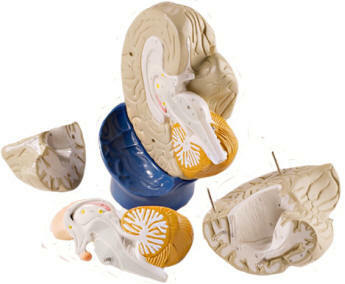 This comprehensive brain model is a very useful teaching aid, especially for large groups of students. 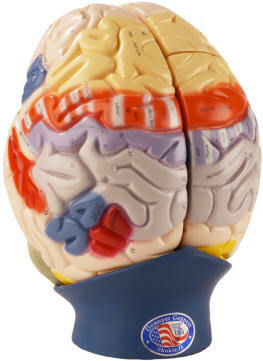 All structures of the brain and ventricles are visible through median, frontal and horizontal divisions. Comes with removable base. Shows arterial blood supply and divides into 8 parts. Steel pins keep this model’s 8 parts together during pass-around, yet allow quick disassembly as well facilitating hands-on study. Components include: the large basilar artery, the pituitary, the right hemisphere which divides in two, and the left which splits in four, including half the cerebellum and half of the brain stem. 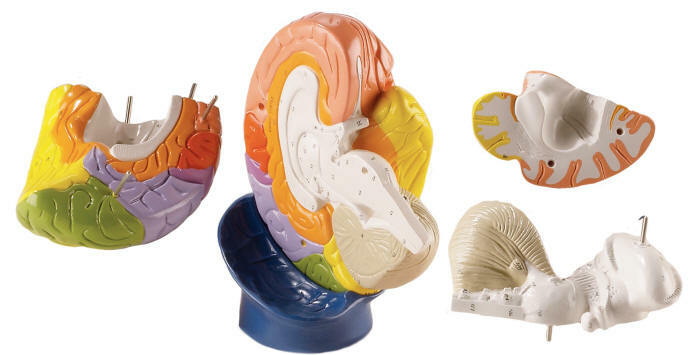 Resting on a molded display base which permits simultaneous viewing of the brain’s superior, inferior and lateral aspects, the nonbreakable vinyl model introduces 100 hand numbered features which are identified in the accompanying key. Overall dimensions: 6x5x7 inches (14x13x18cm). 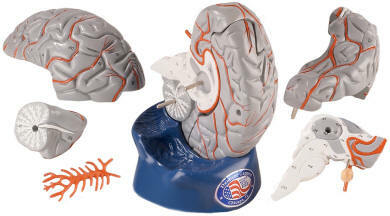 Depicted in full relief and enhanced with hand-painted colors, this giant human brain replica initially divides into hemispheres. 73 neuro-anatomical structures are hand coded on the left hemisphere, while 22 are coded on the right, which further divides in two. 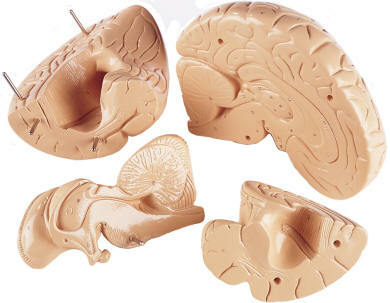 The right half of the brain stem and cerebellum then detach as a unit, revealing an additional 35 coded features. 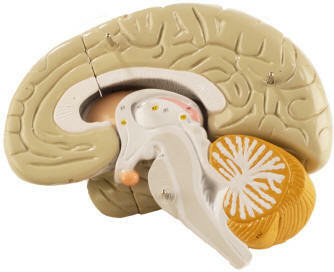 In all, 130 features coded on the model are identified in the accompanying key, with all twelve cranial nerves itemized in standard Roman numeral notation. Overall dimensions: 8x8x10 inches (20 x20x25cm). Molded of nonbreakable vinyl for long life and the detachable segments are secured with pins so they won’t disassemble until pulled apart. The model measures 8x8x10 inches (2x20x25cm) overall. 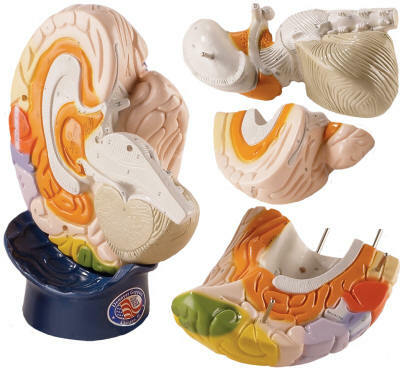 Our most popular brain model reproduces the brain of a right-handed person, employing contrasting colors and hand-lettered captions to locate and identify motor and sensory functional centers. In addition to focusing on the intellectual role of the dominant left brain, and the creative role of the right, the model highlights the emotional, sexual, memory and learning functions of the limbic system. Sensory regions and centers receptive to 20 specific body regions are distinguished, as are the motor centers controlling 19 body regions. More than 120 features, hand-numbered on the model, are identified in the corresponding key. Overall dimensions: 8x8x10 inches (20x20x25cm).